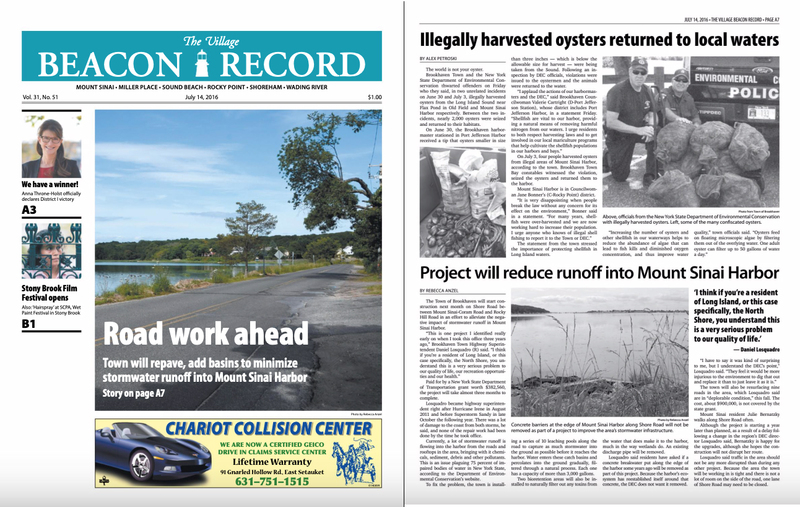 The Village Beacon Record published this piece in print on July 14, 2016. 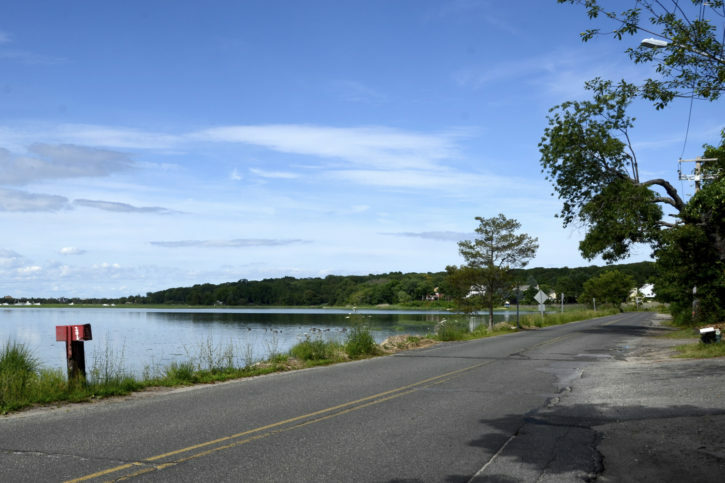 The Town of Brookhaven will start construction next month on Shore Road between Mount Sinai-Coram Road and Rocky Hill Road in an effort to alleviate the negative impact of stormwater runoff in Mount Sinai Harbor. Paid for by a New York State Department of Transportation grant worth $382,560, the project will take almost three months to complete. Losquadro became highway superintendent right after Hurricane Irene in August 2011 and before Superstorm Sandy in late October the following year. There was a lot of damage to the coast from both storms, he said, and none of the repair work had been done by the time he took office. Currently, a lot of stormwater runoff is flowing into the harbor from the roads and rooftops in the area, bringing with it chemicals, sediment, debris and other pollutants. This is an issue plaguing 75 percent of impaired bodies of water in New York State, according to the Department of Environmental Conservation’s website. To fix the problem, the town is installing a series of 10 leaching pools along the road to capture as much stormwater into the ground as possible before it reaches the harbor. Water enters these catch basins and percolates into the ground gradually, filtered through a natural process. Each one has a capacity of more than 3,000 gallons. Two bioretention areas will also be installed to naturally filter out any toxins from the water that does make it to the harbor, much in the way wetlands do. An existing discharge pipe will be removed. Losquadro said residents have asked if a concrete breakwater put along the edge of the harbor some years ago will be removed as part of this project. Because the harbor’s ecosystem has reestablished itself around that concrete, the DEC does not want it removed. The town will also be resurfacing nine roads in the area, which Losquadro said are in “deplorable condition,” this fall. The cost, about $900,000, is not covered by the state grant. Mount Sinai resident Julie Bernatzky walks along Shore Road often. Although the project is starting a year later than planned, as a result of a delay following a change in the region’s DEC director Losquadro said, Bernatzky is happy for the upgrades, although she hopes the construction will not disrupt her route. Losquadro said traffic in the area should not be any more disrupted than during any other project. Because the area the town will be working in is tight and there is not a lot of room on the side of the road, one lane of Shore Road may need to be closed. The town will be resurfacing nine roads in the area, including Shore Road, in addition to the stormwater project. Photo by Rebecca Anzel.